Before his work day starts at 8:00 a.m., Dunn Rasbury rises early to read for pleasure and completes a workout at the gym to clear his mind. It is this routine that sets A&M Supply’s director of flooring up for a productive day. Dunn’s office in Marietta, Ga. is just one hour from where his flooring career began more than two decades ago as a high school student in Dalton, Ga. Since the 1970s, the Dalton-area has produced 90 percent of the world’s carpet products; and the industry employs nearly 30,000 people in the region. Dubbed the ‘Carpet Capital of the World’, it comes as no surprise that the flooring industry is deeply connected to the life stories of individuals and families – like Dunn’s – who call Dalton home. His own beginnings in the industry are humble, as is the nature of most first jobs. During his teen years, Dunn mowed lawns at corporate carpet offices before working summer jobs in dye houses and carpet warehouses. After college, he worked as a flooring distribution sales representative and later opened a small carpet manufacturing business with his father. He owned and operated the business for 20 years. 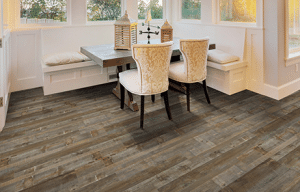 Dunn describes this multi-strip flooring from StoneCast as a defining feature for a minimalist space. Now, as director of flooring at A&M Supply, Dunn spends his days in the field with sales reps, on calls with customers and managing vendors for a wide array of flooring options – from solid wood to engineered wood and luxury vinyl to carpet tiles. Beyond his expertise, Dunn is proud of the role he and his team have in ensuring the end-user is pleased with their flooring solution. Over his career, Dunn has remained passionate about the growth of the industry and its people. 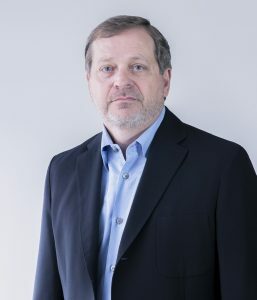 He is a respected expert in the field and a champion of innovative practices who shares new approaches with his team at A&M Supply and with the industry at large as a board member at the North American Association of Floor Covering Distributors (NAFCD). 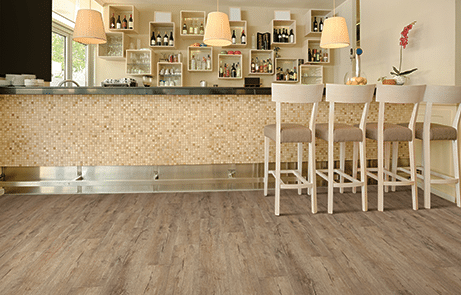 For Dunn, this “Great Smoky” flooring by Fusion-Hybrid makes this bar area feel like home. Having experienced many of the roles the flooring industry has to offer – from distribution to business ownership, merchandising, designing and more, Dunn has strategic insights into industry gaps and opportunities for growth. Dunn is most notably known for his focus on the art of sales. To build a team that thinks outside the box, Dunn starts with a unique approach to hiring. Dunn will be one of the thousands of industry leaders attending the DOMOTEX USA Show Feb. 28 – March 2, 2019 in Atlanta. He looks forward to meeting with clients and vendors from across the country right at home, in the heart of the flooring industry. “It is very exciting to have a flooring trade event so convenient and accessible to the core industry here in Georgia,” adds Dunn.